"Dad, can we show you something outside?" said Martin when I was home earlier than usual on a beautiful sunny afternoon in the last days of daylight saving. "What are you going to show me?" I asked, as I have to make it worthwhile. "Zach and me and his bike," he replied. "What's so special?" I enquired. "Zach's not pedalling and I'm not riding it." he explained in his own unique fashion. I sat back and pondered how one could achieve this fine double negative and went out to see what they were doing. 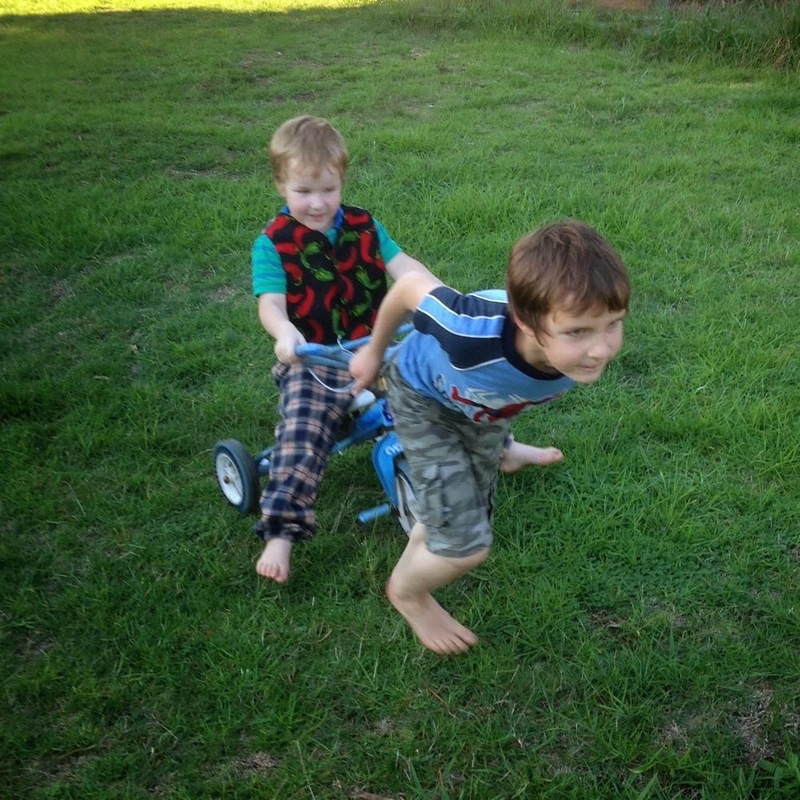 Zach was on the seat with his legs in the air and Martin was pulling on the rope attached to the bike's handlebars. So Martin did provide an accurate description after all. The bike is about 30 years old and the old brittle plastic is not strong enough for older children so this is their solution so they could both play with it. "But I had to do most of the work," added Martin as I am typing this. Clare and Rose wanted to buy some American Girl dolls and the various accessories. Although Clare has earned the money working in our shop, the cost to purchase and ship to Australia was exorbitant. Clare was willing but our parental veto was invoked. Although disappointed, Clare accepted the decision. A short time later Aldi was selling 18" dolls for $25 with a starting outfit. Deal! Now it was a matter of dresses and accessories. Both grandmothers are very good seamstresses and Lana has the skills too. So this has provided a great opportunity for Clare to learn the skills doing something she wants to do. 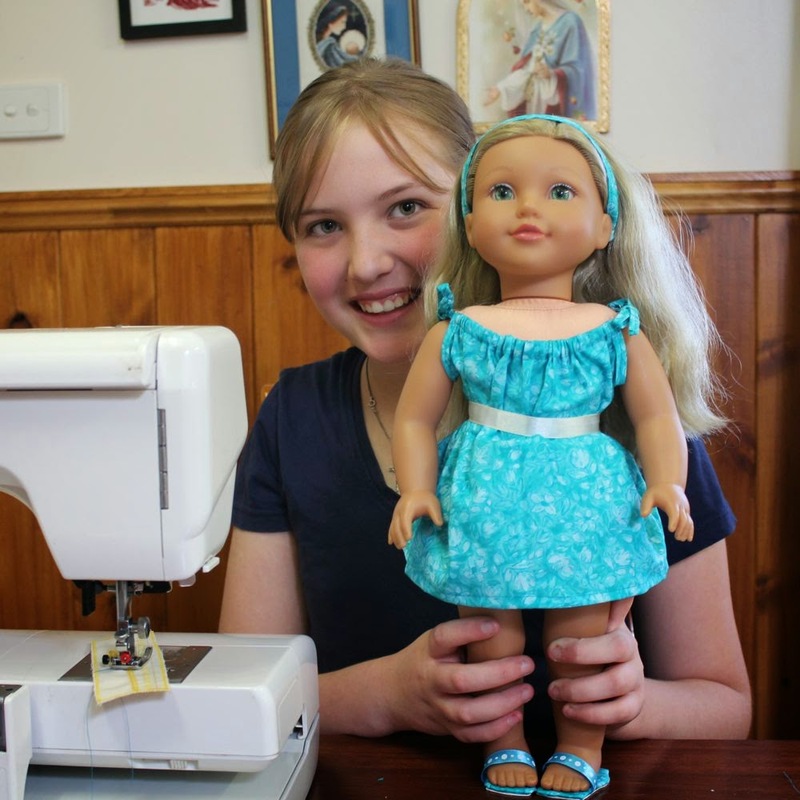 We purchased some doll patterns for very reasonable prices (some Free) from You Can Make This and with some initial tutoring from Lana, Clare has been quite busy. YouTube has also been handy with instructions for making shoes. This photo shows her first attempt at shoes and her first dress from the patterns she purchased. Based on this method of dressmaking, for the cost the one American Girl doll we will have quite a wardrobe of clothes and accessories! Now all this sewing is done after "Schoolwork" and on the weekends. Because this isn't schoolwork, but fun! This is only for frogs. Green frogs. 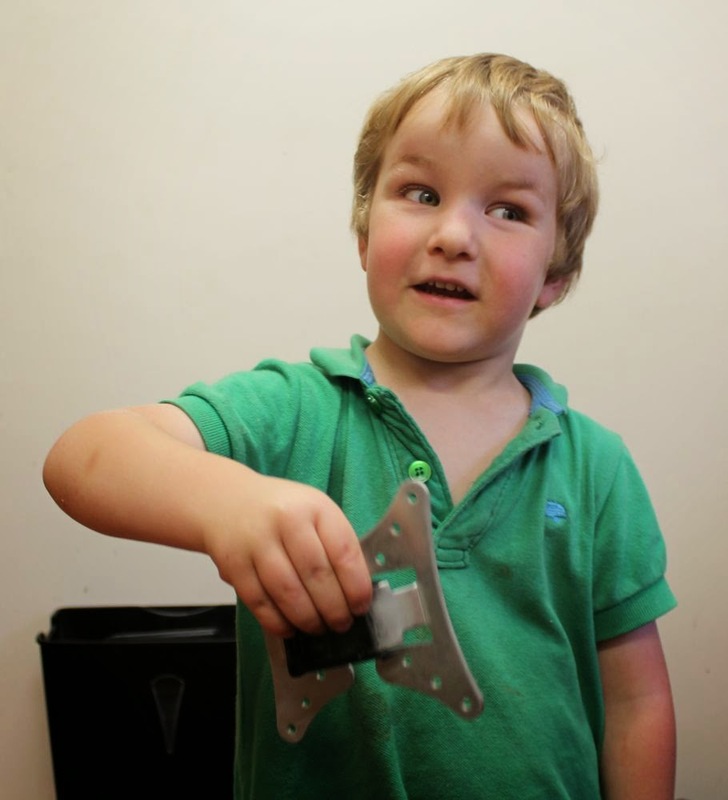 While rummaging around in my office Zach discovered this metal thing which is designed to connect a wall bracket to a Flat Screen TV. "What do you have there, Zach?" I asked. "It's for their hair. Frogs have green hair and this is used to cut their hair. There aren't any around here but they live in water. And frogs drink water too. That's why we don't see frogs with much hair - only a little bit of hair - because of this thing." There you go. You learn something new every day. 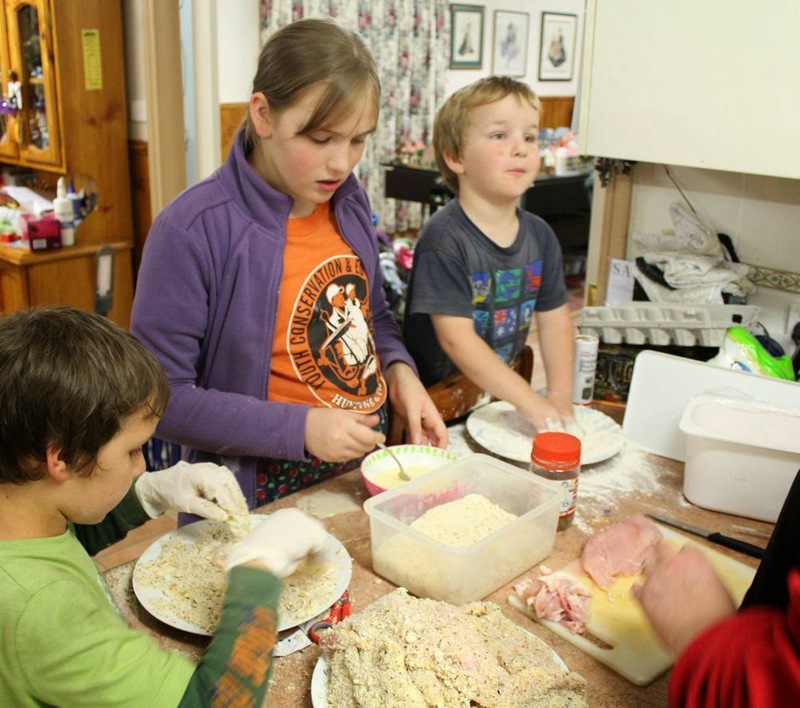 As a family we enjoy the taste of home made crumbed chicken. Remembering the story of the little red hen and the making of her bread, everyone gets to help. Lana chops up dried bread in the food processor and then we mix in some pepper and basil and if - we feel up to it - grated lemon rind. The children then line up for the manufacturing process. Lana slices the chicken breast into thin pieces. This goes to Zach (4) who coats it in plain (general purpose) flour. Clare (13) then dunks it in an egg and milk mixture. Martin (6) then coats the wet thing in the bread crumb mixture and adds it to the pile. Meanwhile, Rose (9) and Peter (15) washed and cut up the potatoes that had been peeled by Clare. Rose cut and peeled the carrots. Once the potatoes, carrots and peas are boiled, Ariel (22) will assist with the frying of the chicken schnitzels in the electric fry pan. James (17) and Peter will then help set the table that has been cleared by the other children. After dinner, James and Peter will do the washup, with the younger ones filling or emptying the dishwasher as required. So when people ask us "How do you cook for so many?" we can simply answer, "Together". This really works well because we have the lifestyle that homeschooling allows. We have no school homework or incessant "extra-curricular" activities to interrupt these life skills. I think I will record this as today's "Home Economics" lesson. The children went outside to play in the beautiful sunshine. The initial decision was to go on the trampoline, but this changed to riding bikes. This meant Zach was left out as he isn't up to bike riding speed yet. So he came in upset and told Lana all about it. Then he stopped and said, "Peter!" and ran off. A short while Peter came in and explained what Zach had done. Zach asked Peter, "Jump trampoline with me!" Peter replied, "My feet hurt. I've been working all day." Zach raised his hand with spread fingers and said, "Only this many whiles." So they went and played on the trampoline. A very short while later, the others noticed the activity on the trampoline and soon they were all on the trampoline after all. But only for a "while". This time of year is Show Season and it is a very busy time for Lana and the girls. Although the boys used to put in some entries, the girls plan all year to put in entries and combined with Lana and her Mum we end up providing a reasonable share of the Pavilion entries at the local shows. I put in my photographs for which I get some prizes, but Lana and the girls really collect the accolades. This is especially true in the junior classes. Over the years we have seen a steady drop in the number of junior entries. 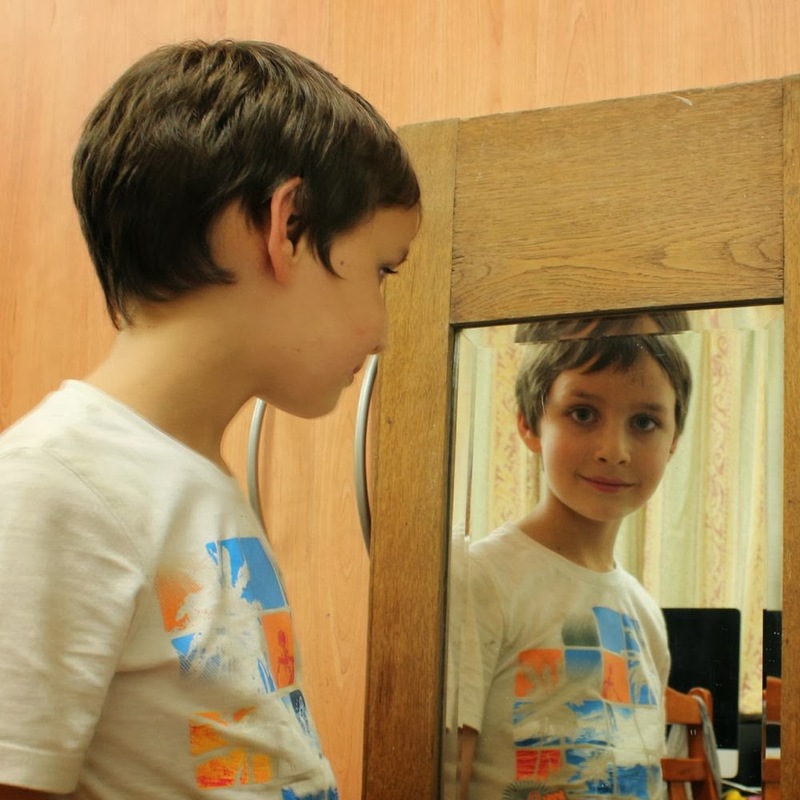 Homeschoolers seem to represent over 75% of the entries, especially if you exclude the school entries which consist of 20 to 30 identical projects with minor variations to show each child's individuality. 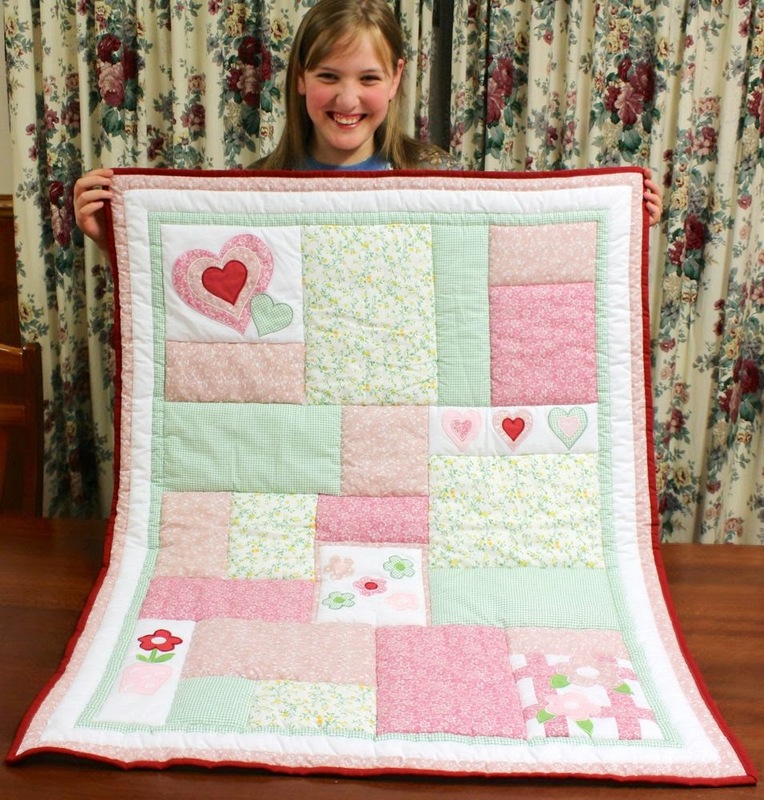 It seems that young people are just not learning traditional crafts such as quilting, knitting, cooking, cross stitch, and so on. By young people I mean people our age and younger. As the older contributors start getting past their ability to do as much crafty things, the number of entries steadily decreases. This year we put in 39 entries in one show and 49 in the other main show. That is a lot of work, but it is fine encouragement for Lana and the children to see their work put to the test and deemed worthy of praise. It's not just me telling them it looks good. Our cats enjoy having Opa and Grandma living with us. We feed them 2 meals a day with just the basics. But the cats know if they look longingly at Opa or Grandma they get various bonus meals and special treats. 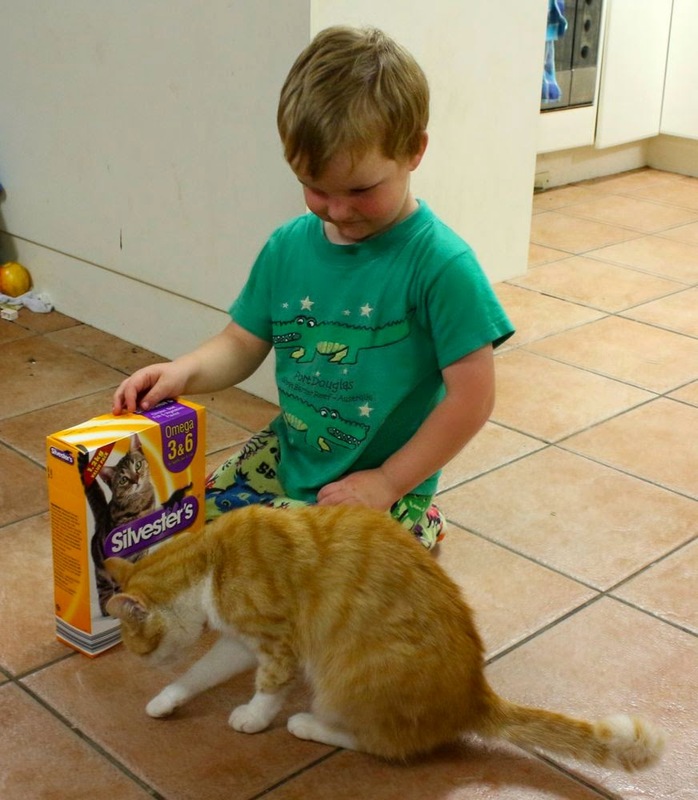 While Lana's parents are away travelling, the cats are missing on all the treats. But lately we noticed the dry food was running out. After some investigation we realised that whenever the cats whined a little near Zach, he went to the dry food container and gave them more by filling up their bowl. What they didn't eat, the birds came in and had their share. No wonder we never knew where it was going as the bowls were always empty when we looked! Wasn't he helpful? So I thought I would take a photo of Zach and the cat for this article. Have you ever tried getting a 4 year old and a cat to stay still long enough for a photo? Every Bed of Roses is hosting the 428th Carnival of Homeschooling. Our post about Eric doing some Apprentice practice at our shop is included. As a follow up, the dinner is this Friday and we have our 30 bookings. It should be a great night! There are a number of Agricultural shows this time of year and they are all managed by groups of volunteers that donate a lot of time and energy to providing a venue for the local area to show off all their livestock, produce and arts and crafts as well as providing a few day's worth of entertainment. Each town and group have their own style which allows for friendly competition between shows and room for experimentation. Most now have a special school children special on the Friday which allows school children to get in for free with up to two or three adult supervisors. It is a great idea to encourage the children to get in touch with farming and their local produce. Other shows recognise that if you are at the gate during school hours with a number of children that look part of a set, you are most likely homeschoolers. But one show we attended recently felt it was their job to police eligibility. Obviously they felt there would be a problem for truant children coming to the show with their parents trying for free entry. 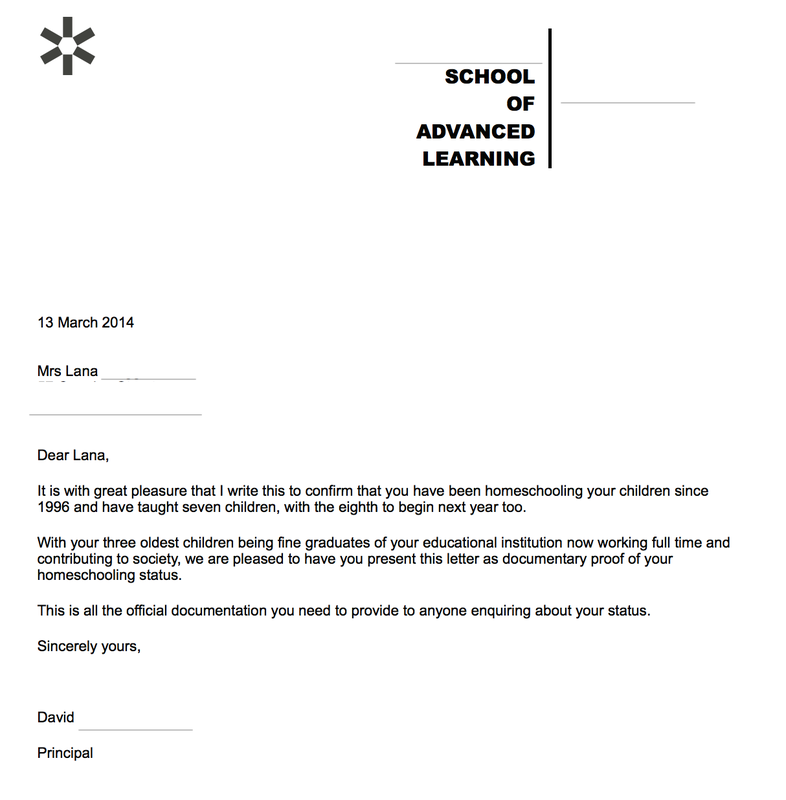 The guy in charge decided that homeschoolers had to present a letter proving they were homeschooling. A stupid policy requires an appropriate response. The local schooling board provides a letter to homeschooling families which could be shown to satisfy this requirement, but they had no right to see it so that was not an option for us. So I wrote the above letter (click on it for a closer view). On the Friday, Lana went up to the entry gate with Ariel and the two younger girls and presented the letter. The lady at the gate just opened it, glanced at the letterhead which looked official and showed it to the gate man in charge. He glanced at it, nodded and said, "Yeah". So they let them all in for free. Lana was ready to have a rant and argue the stupidity of the policy and they didn't even read my lovely letter! As a family we put 39 exhibits into the Pavilion. (This is the large shed which contains all the arts, crafts, photography and smaller non-livestock exhibits at the show). Other homeschooling families also put in lots of entries. If there were no homeschoolers putting in entries the Pavilion would be about 25% emptier. One more interesting thing. Lana asked Martin if he wanted to come to the show. "You will have to have a bath first" said Lana. "I won't go then," answered Martin, so he stayed home. I really have to read Tom Sawyer to the children. I think they will recognise Tom. Would you eat a dinner from this man? As part of our practical homeschooling, we are able to use our business to provide unique opportunities for each of our children depending on their differing talents and desires. We are about to start a monthly series of Chef's special dinners in which our son, now a 2nd year apprentice chef, will be preparing a three course meal for 30 diners. 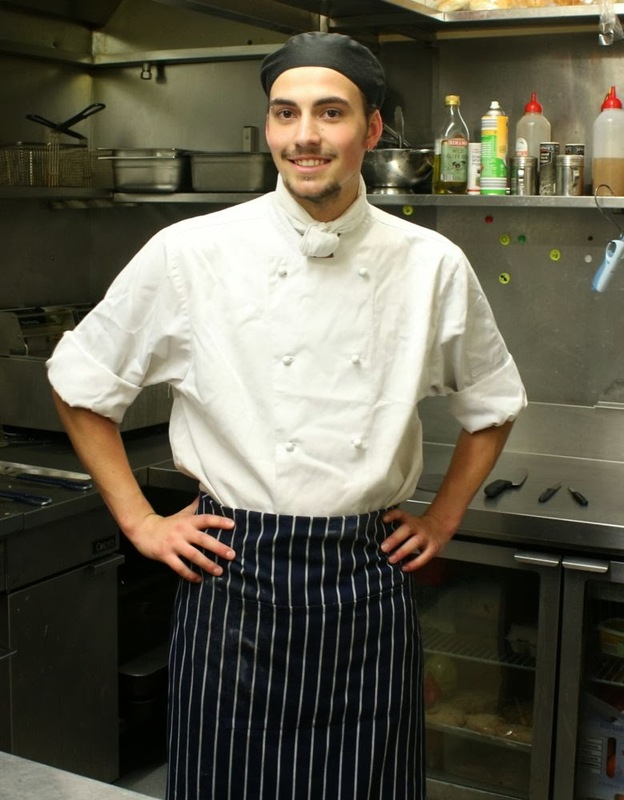 This is a good opportunity as almost all of the diners already know him from his time working at the shop, and we are able to combine our experience of serving larger groups with his experience as an apprentice chef. Part of the preparation was doing a trial run for just the family, but as this is catering for 10 people, it is a pretty good trial. The meal was excellent and together we were able to apply a few refinements to the preparation plan and only one or two tweaks to the meals. Our taste buds are still remembering the fine dinner. To make sure the dessert work at the scale required for 30 people, we made a large cake even though it was just for us. Only some of it was eaten at the trial, but the rest went extremely well with our cafe customers next day. General reaction was sighs of satisfaction and queries as to where we had obtained the cake. We just said our son did a fine job! It's good seeing positive results to our evolving education plan over the years. Concentrating on the fundamentals and providing good work experience earlier on has helped create a citizen that can make an excellent contribution to the society. Selling like hot ... muffins. 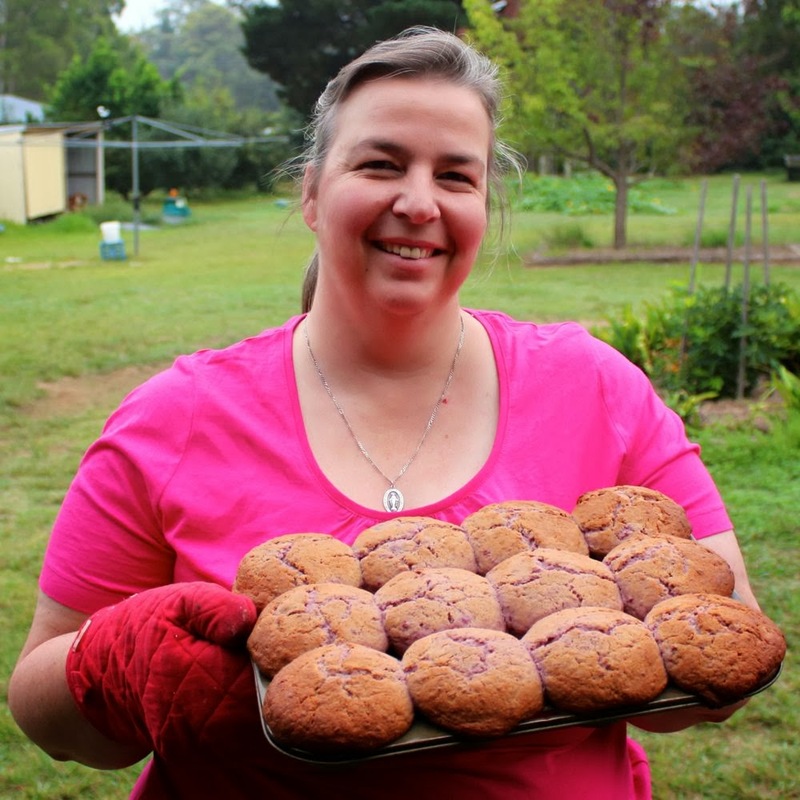 Once more Lana has been awarded 1st place for her muffins at the local agricultural show. These shows are like Farm shows, State Fairs, 4H fairs and so on with livestock and produce competitions and the pavilion containing crafts, art, cooking and so on. We sell the muffins each weekend at our shop and they are easy to make. It takes a half awake Lana about 45 minutes to make from start to out of the oven and out the door. They are moist muffins that don't need a drink to wash them down. They taste just fine as they are. This is a very forgiving recipe. Makes 12 large muffins (pictured) or 20 regular sized patty pan/cup cakes. Preheat the oven to 180°C (350°F) and line 12 jumbo muffin pans with paper cases. Place the butter, cream cheese and sugar in the bowl. Mix with beater until pale. Add the eggs one at a time, beating after each addition until just combined. Add the vanilla and fold in the flour and a pinch of salt. Dust the fruit with a little extra flour then stir through the mixture. Spoon into the muffin cases and bake for 25 minutes or until golden. They taste great just out of the oven and over the next few days are even better as the flavour spreads through them. Mixing chopped/sliced strawberries and raspberries. Raspberries and white chocolate bits (except during Lent). 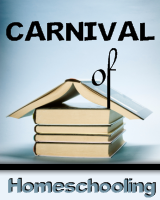 The 427th Homeschool Carnival "Just Keep blogging" edition. Our post about Rose not doing schoolwork is included. If I had a twin he'd be great. Rose asked Clare a question and Peter interrupted with a silly answer. Ariel said to Peter, "Rose asked Clare a question? Should I call you Clare from now on?" Clare said, "Oooh. I have a twin sister called Clare." Rose piped in, "Not a sister, a twin brother." "Yeah, a twin brother called Clare," said Ariel. Martin had been carefully listening to this exchange and added his thoughts. "I'd love a twin brother. He can do my school work. He could clean up while I play with the neighbour." "Oh you're a generous brother," Peter commented. "I could get him to ask for stuff so if he gets in trouble he can get sent to bed." Martin replied. I somehow suspect Martin hasn't quite understood the concept of a twin brother. Reminiscing at the latest birthday. 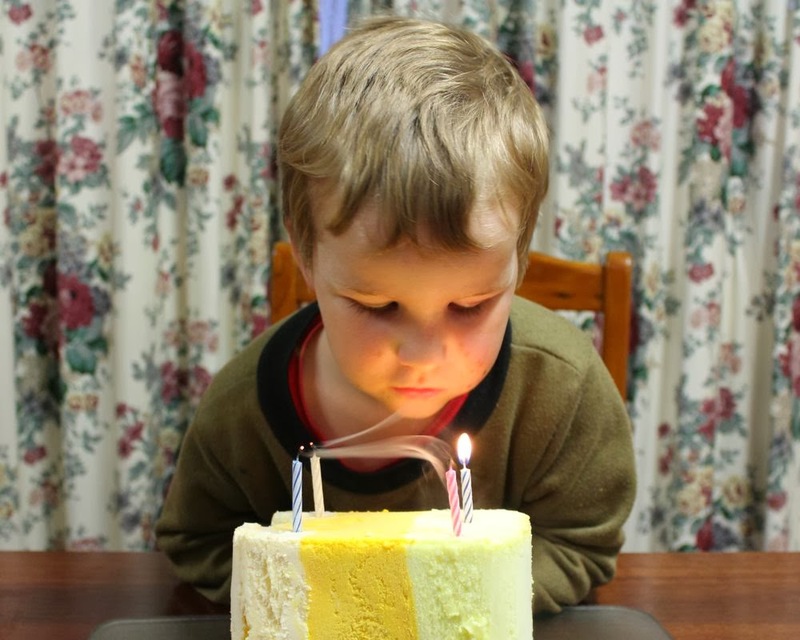 We celebrated Zach's birthday recently and it was a sort of milestone. I was chatting with a new acquaintance recently and he mentioned to me that he had 3 children under 7. I paused for a moment and considered this measure. "We've had 3 under 7 for the last 15 years!" I replied. But that is no more. Now Zach is 4, we have no more nappies, less shared night-times with the Starfish sleeping technique of babies, no night time feeding and many more activities that a 4 year old is now too old for. He and Martin are playing much more together, rather than having occasional fights for control over a shared toy. For 22 years of being parents we always have had a new younger one bringing up the rear while we handled new adventures with the older children. We are now in a new phase. Not better or worse, just different. Again. It is a great adventure, privilege and honour to be able to be such a part of a family. Being able to share so many of our experiences together, through homeschooling, running a business, and generally living the busy life of 10 people is a great blessing. Too often we think of family life and children primarily in terms of their costs and responsibilities. But I think this is missing the point. We are told that children are a great gift and will be of great benefit to us. I suspect much of that beneficial nature is lost when you focus incorrectly. It's a bit like pointing a camera using manual focus and not knowing you have to move the lens to see better. Initially the object of your focus is blurry and indistinct, but as you turn the lens you suddenly see all the good bits and soon all the non essential parts can be ignored as the focus is on the gift - and then on the gift giver. It was a wet and relatively cool day so we were all inside. Rose figured this was a good time to make something from the recipe book she borrowed from the library. "It's real hot chocolate, Dad," Rose explained to me, "And it's a cold day so it's perfect." 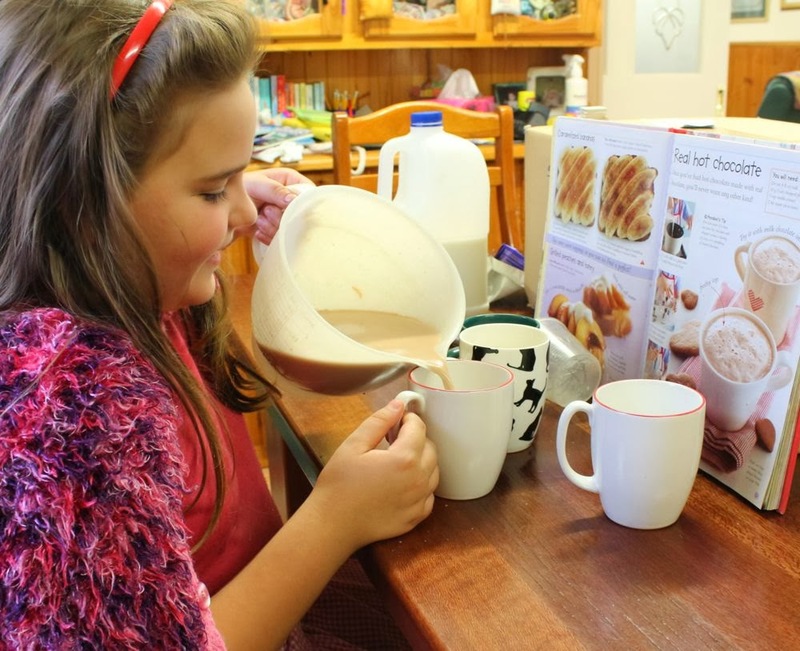 So she made it all herself, following the instructions, making enough for everyone, boiling the milk, mixing the ingredients and sharing it out. It all worked out really well, and the best thing was that this wasn't schoolwork. It was fun.